When we first looked at our house (yikes – has it been two years ago already?!?! ), I was super psyched that it had a white kitchen! 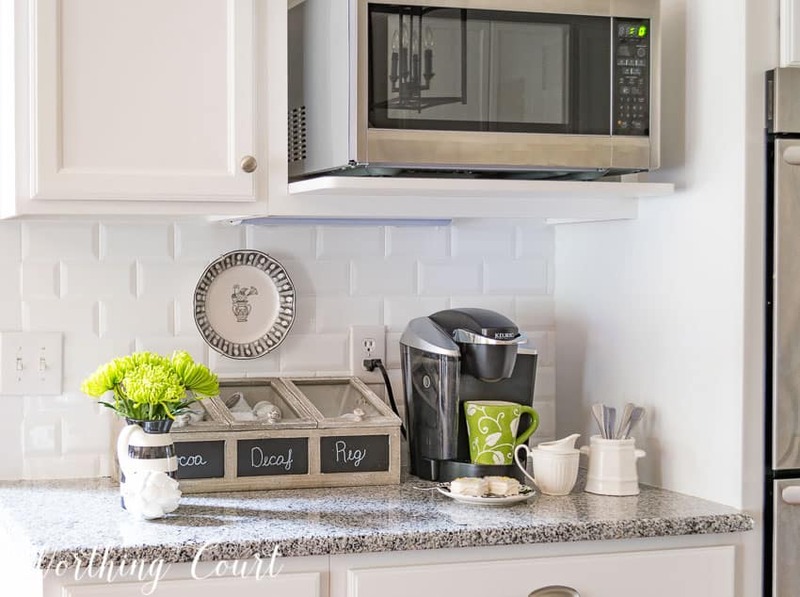 The layout wasn’t perfect, but I thought that we could get away with making just a few changes to the existing kitchen that would hold down the cost and would still give me the white farmhouse kitchen of my dreams. Sadly, it didn’t work out that way. 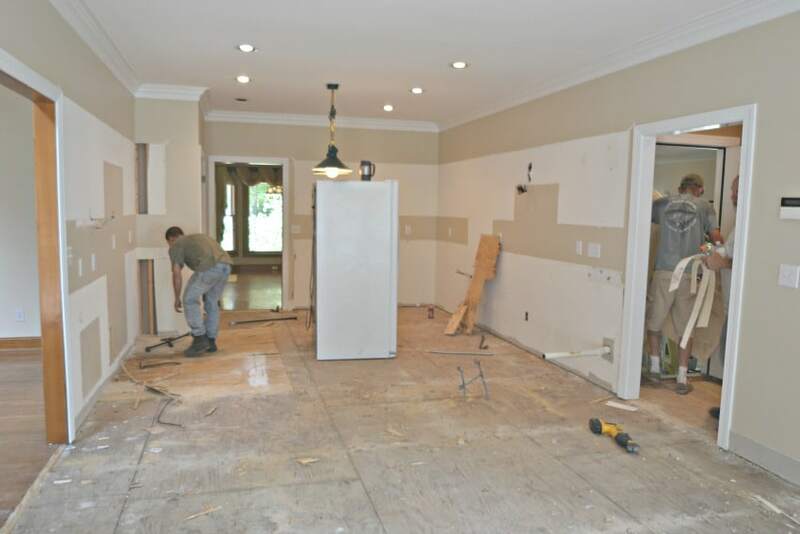 UPDATE: Not every remodel goes according to plan or turns out the way that you wanted it to! Click HERE to read all about the good and the bad decisions that we made. I knew that we were going to replace the flooring, but I had hoped that we could keep the original cabinets and add small ones above them (9′ ceilings). 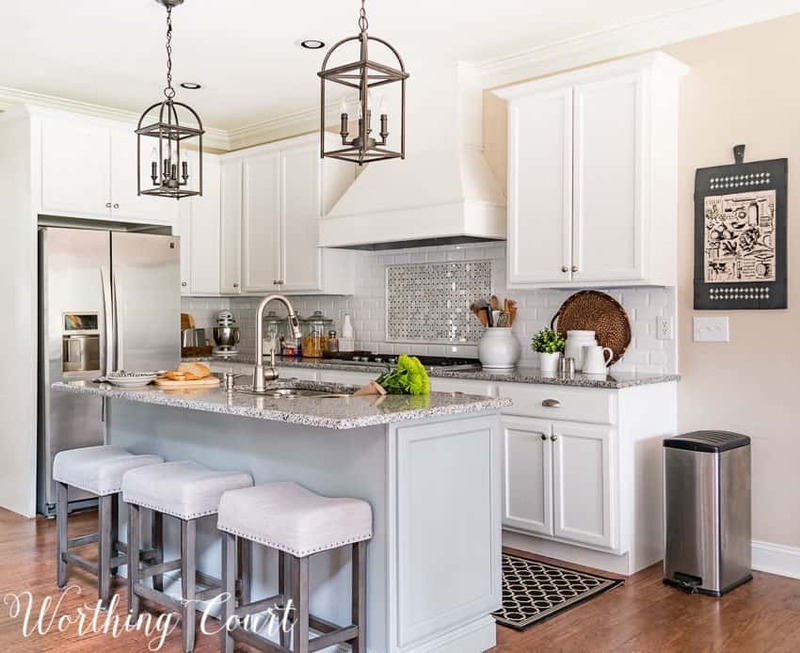 Then replace the appliances, replace the laminate counters with granite, replace the island with a larger one and replace the billiard table light fixture. For the sake of saving money, I was even willing to keep the same location for the wall oven and cooktop and to leave the peninsula where it was. On the opposite side of the kitchen, I was happy with the pantry (except that it was disgustingly filthy!). I was going to keep the fridge location the same and set up my coffee bar in the little nook to the right of the fridge. I was undecided about what to do with the desk. Upon further inspection though, we found that while the cabinet boxes themselves were in good condition, the Thermafoil, that they were covered with, had started to come loose in several places. I wasn’t about to spend the $$$$ to replace the counters with granite, or some other costly material, when we just didn’t know how long the current cabinets would last. In addition, we discovered that the cabinet above the wall oven looked a little scorched. Not good. Sooo….after much research about the longevity and overall quality of twenty year old Thermafoil, this is what happened! Pookie and my daughter’s fiance had all of the original counters and cabinets out in a couple of hours or so. 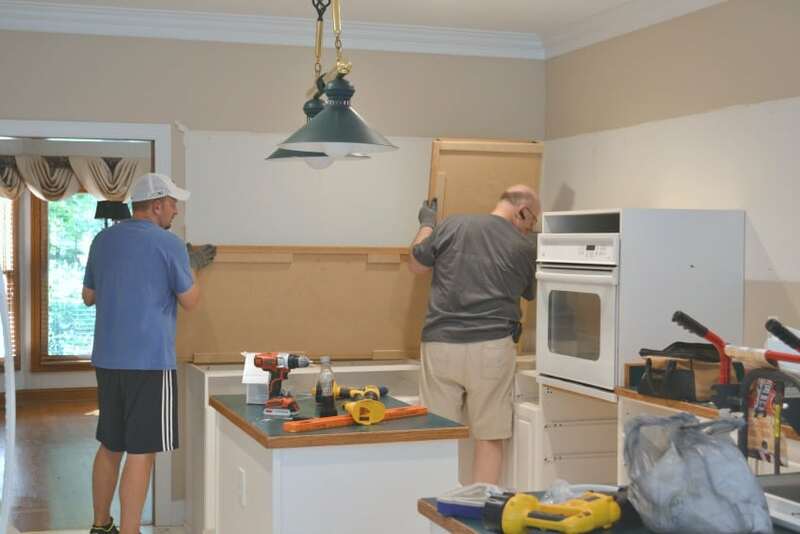 Don’t worry, we were able to reuse several of the cabinets in the laundry room remodel and the rest of them were given to someone who was redoing their basement kitchen. Then the job was turned over to our crew who removed the old linoleum and sub floor. I won’t bore you with the details, but removing the old sub floor turned out to be one of the most difficult demo jobs in the whole house. Ever so s-l-o-w-l-y things started to come back together. First came the hardwood floors, which had to be feathered into the adjoining family room and then stained and sealed with poly. And finally, the new cabinets and appliances. Then began the long wait for counters and a backsplash. Oh, I was so impatient! We had moved in at this point and were using an old piece of laminate, that we happened to have, as a temporary counter on one side of the kitchen. We put an old microwave there and used the ovens for cooking more frozen meals than I care to remember. All of the dish washing took place in one of our bathrooms. Fun times. After many, many weeks our kitchen was finished and here she is today! It’s usually the details that trip you up, right? Well, I pretty much knew everything that I wanted in the kitchen, but when it came to the backsplash, I froze. After bringing home a myriad of samples and visiting tons of local tile stores, I wound up using a simple, beveled edge, subway tile. The decorative tile inset above the cooktop is a carrera marble mosaic framed with carrera pencil tile. We found every bit of the tile at Home Depot. Instead of leaving the refrigerator in its original location, we moved it to the end of the kitchen. Panels were added to each side of it to give it a built-in look. It turned out that the corner beside the fridge made a great little nook to tuck away our toaster and standing mixer. Two wall ovens and the microwave were added to the opposite side of the kitchen, beside the pantry. The only thing done to the pantry was to give it a very thorough cleaning. The counter beside the wall ovens is my coffee and hot beverage nook. Many of our layout decisions were based on not only wanting to enlarge the island, but to provide counter seating as well. The original layout had the kitchen sink and dishwasher in the peninsula. We choose to eliminate the peninsula in favor of an island and placed the sink and dishwasher there. The one thing that I could not get in our new kitchen was a large window above the kitchen sink. Boo. But in the end, I realized that it really doesn’t matter. All I need to do is turn my head to the side to see out the windows of our breakfast area. Our kitchen is a long room with the breakfast area located at the other end. To give you some perspective, you can see a corner of the island counter in the foreground. 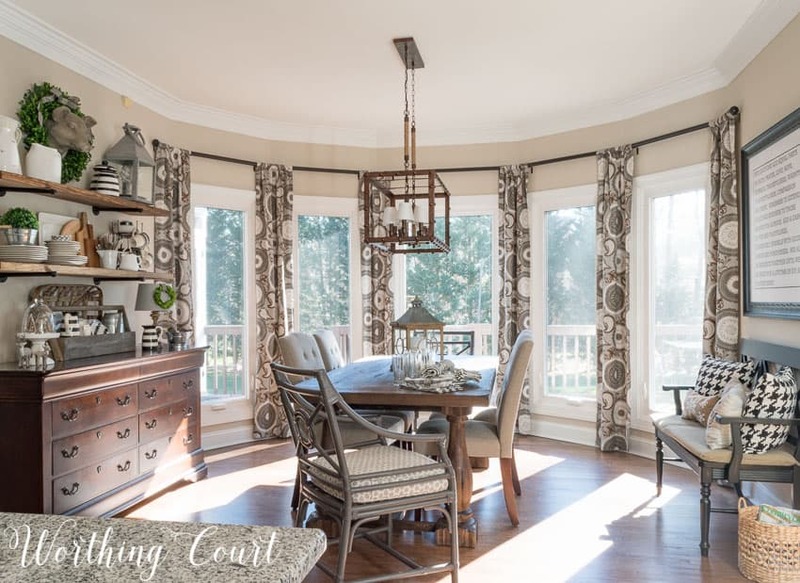 To see the before and after remodel of our breakfast area, click HERE. For two people who have zero experience in kitchen remodeling and design, I’m pretty proud of the end result! It has turned out to be a very functional and easy kitchen to work in. This post is already super long, so I’ll be back tomorrow with more details and why we made some of the decisions that we did – the good and the bad. 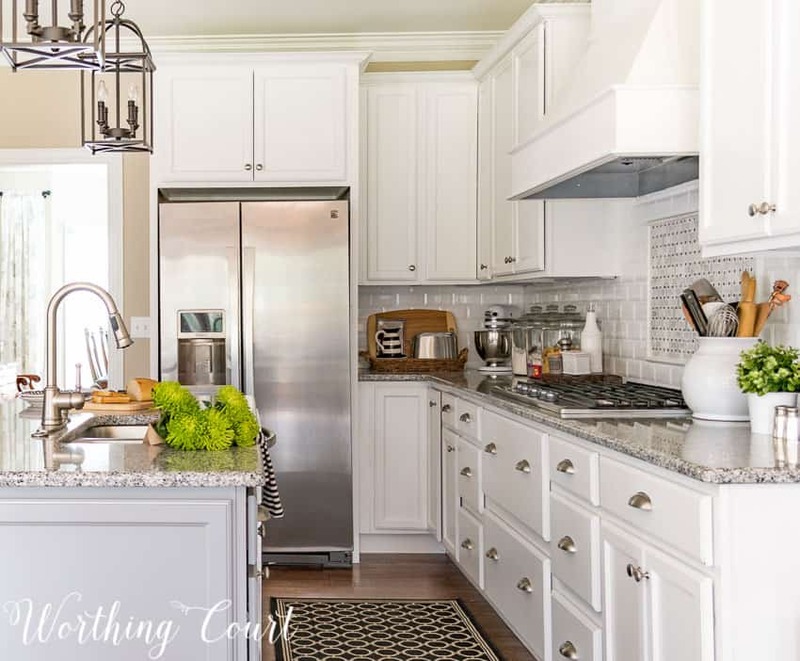 IF YOU’RE LOOKING FOR WHITE KITCHEN INSPIRATION, PIN IT FOR LATER! I absolutely love your kitchen! Everything about it is wonderful. I want to come cook in your kitchen and the way you’ve set up your sink and dishwasher I’d even do your dishes! All of that to say It is gorgeous and functional and I know you’re finally enjoying it! Good work guys! Aw – you’re so sweet, Dolly. You can come over and cook in my kitchen anytime!!! There are so many great details! 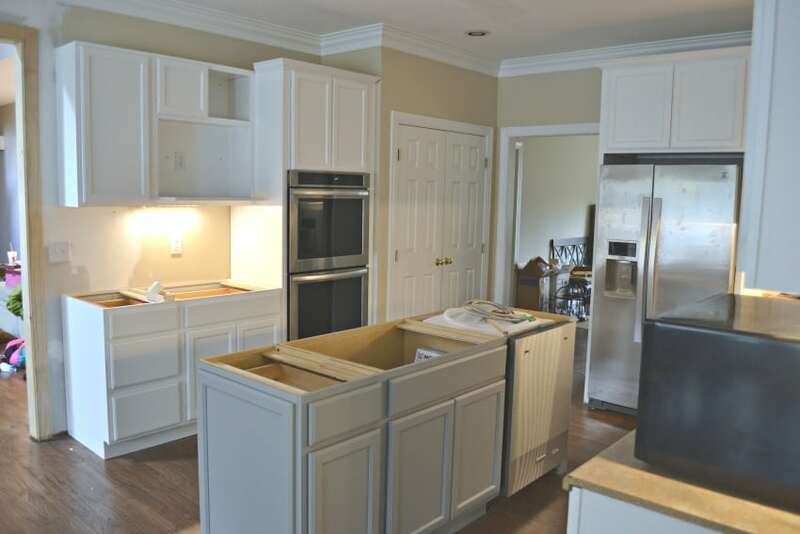 One thing I really like is the different colored island cabinets. Do you remember where you got the white crock you store utensils in by the range? Hi Anna. I’m pretty sure that I got the white crock at TJ Maxx. 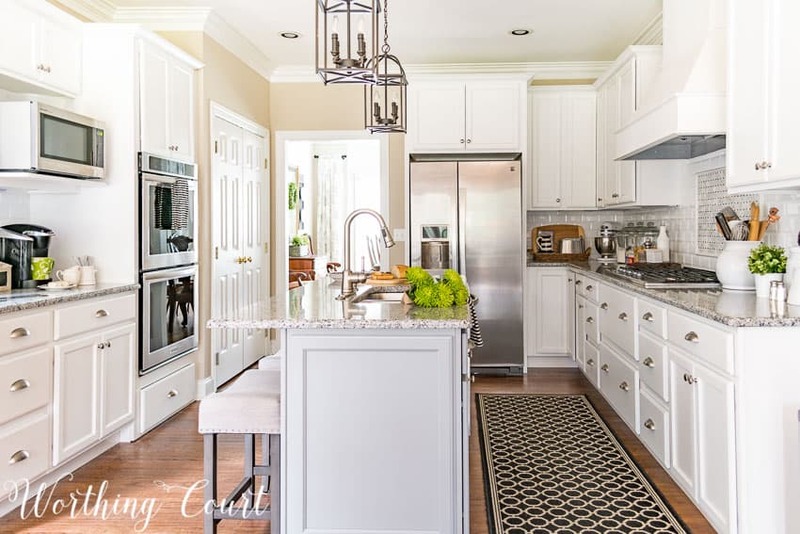 I love a white kitchen and this one is beautiful and functional. I’m impressed. It turned out super! Love your materials. We are in the process of redoing our kitchen – kept the cabinets and layout as is but new countertops and backslash will transform it. I, too, wanted a big goer window over my sink but it is not to be. You are fortunate to have the view from your dining area. Oh well. We can’t have everything. I’m just glad to get rid of the Formica! Hi Cecilia. I know what you mean – I was glad to see that Formica go too. Have fun with your makeover! It is beautiful GF! 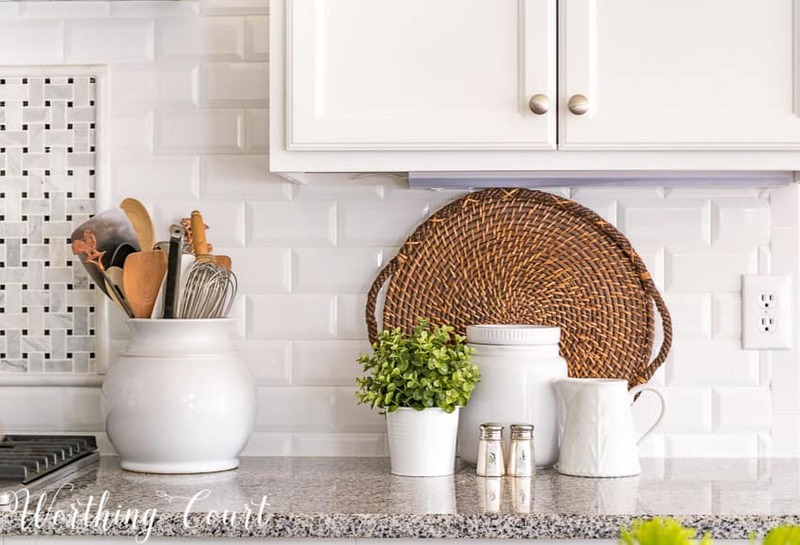 I love your final choice of the beveled subway tile and basket weave Carrara tile. The perfect final touch! Thank you so much, sweet friend! You may remember how much I agonized over what to do for a backsplash. Thank you, Shirley! Hope y’all are doing well. cabinets are white Shaker , Carrera Marble countertops with light gray walls and dark gray tile floor. The stools are exactly what I’m looking for!! Hi Donna. So glad you like my kitchen! The stools came from Target. As far as I know they’re still available – I saw them in the store just the other day. Mine are counter height, not bar height, but I think they’re available in both sizes. Hope you’re having fun with your remodel – your finishes sound beautiful. Your kitchen is stunning, Suzy. Both In pictures and in person. You did a fabulous job with it! Your kitchen is beautiful! It’s so inviting, just like the rest of your lovely home. Your rearrangement of elements and appliances make it look so much bigger and gives it a wonderful flow! What an amazing re-do. I love seeing the “before” and “after” projects. I’m addicted to HGTV. Your island is beautiful. I enjoy all of your blogs. 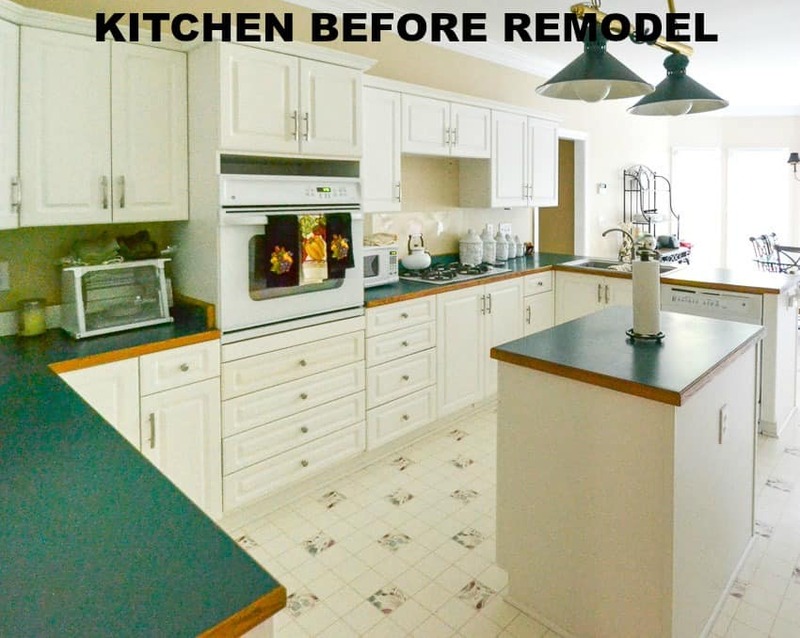 Such a beautiful transformation, your new kitchen is lovely! Love love your kitchen remodel!! How long did the project take? We’re thinking of remodeling our kitchen but i’m just not sure I can live so long without it!! Hi Denise. It’s kind of hard for me to give you a specific answer. We purchased the house at the end of July, but didn’t move in until the end of September. 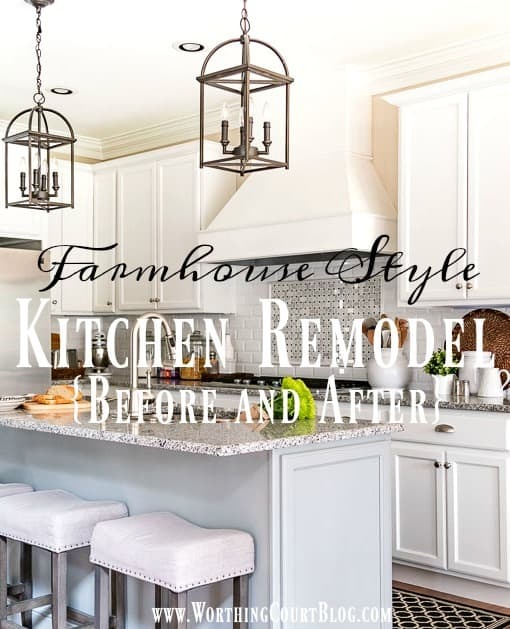 We started the remodel immediately after purchasing the house, but things were being done all over the house at once – not just in the kitchen. So I guess you could say that we started the remodel in July (demo), but didn’t get the counters installed in the kitchen until sometime in October, I think. We really dragged our feet and didn’t get the backsplash done until after Christmas that year. We don’t have small children living at home anymore, so that made the whole thing a bit more tolerable. It is stunning! What a huge undertaking…all your hard work certainly paid off! I seriously love your kitchen! What subway tile did you use? I love the shape of them! 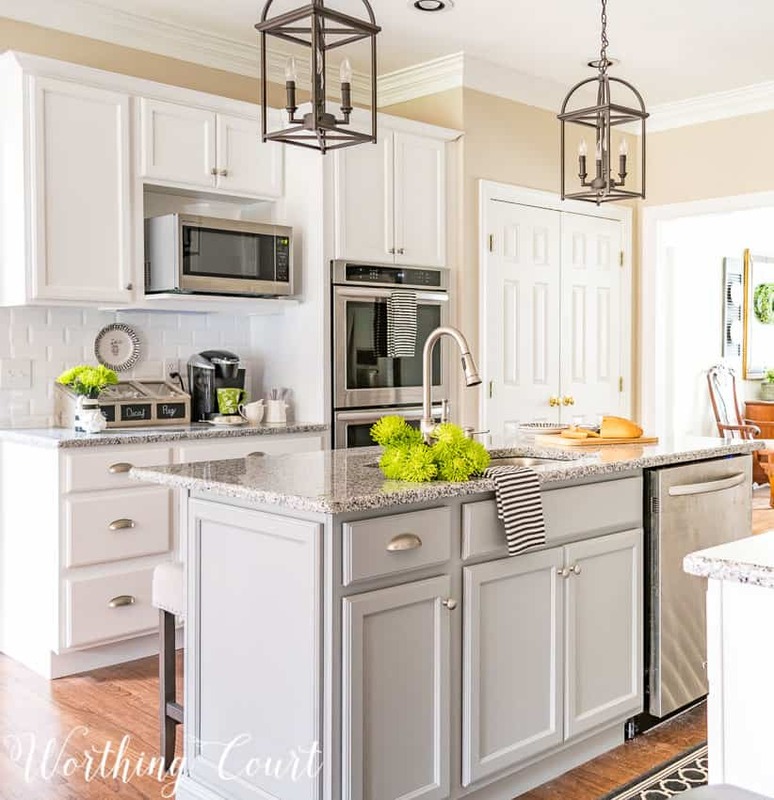 I am such a fan of white farmhouse kitchens! Glad you like my kitchen, Chelsee! Our beveled subway tile came from Home Depot. I don’t remember exactly which brand it was, but here’s a link to several that they carry: http://www.homedepot.com/s/beveled%2520subway%2520tile?NCNI-5 . Hope this helps! Thanks for the link! I love the beveled edge tile! I am in the middle of an enormous house reno and I so love this tile. I have a farmhouse that I am remodeling and every bit of reno inspiration/tips helps! Your kitchen turned it fabulous Suzy and how fortunate that everything worked together in just the way it did so you could do some rearranging of the layout. It is a much better one now. We did one kitchen remodel ourselves and it’s a good feeling isn’t it? You and the hubby can be very proud of your hard work. I am smack in the middle of trying to make major decisions about our kitchen remodel and must say yours turned out wonderfully! A question I have in trying to configure my own is this: how much space is there between your island and the closest run of cabinetery? I’ve heard 45″ is ideal, 42″ is good and 36″ is acceptable. What are your thoughts, please? Any advice you give will be greatly appreciated! Hi Carol. This is something that we really struggled with. 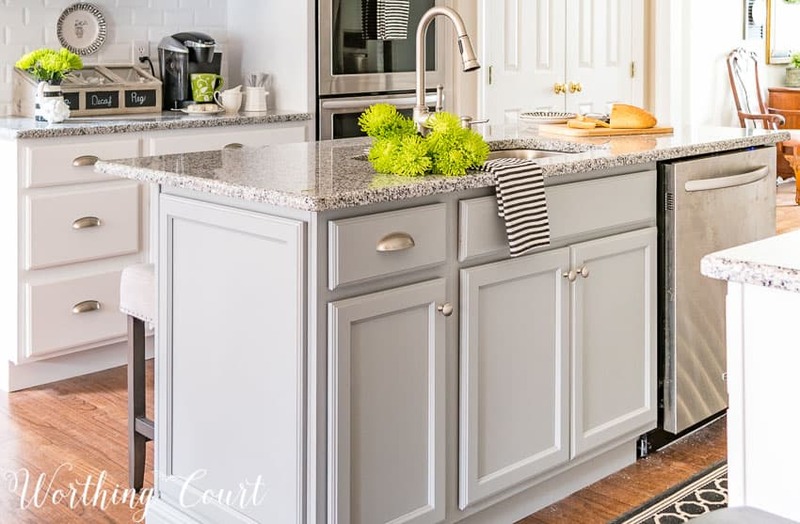 We heard the same things you did about the ideal measurements, but I really wanted to have a large enough island to have an overhang for stools to tuck under. 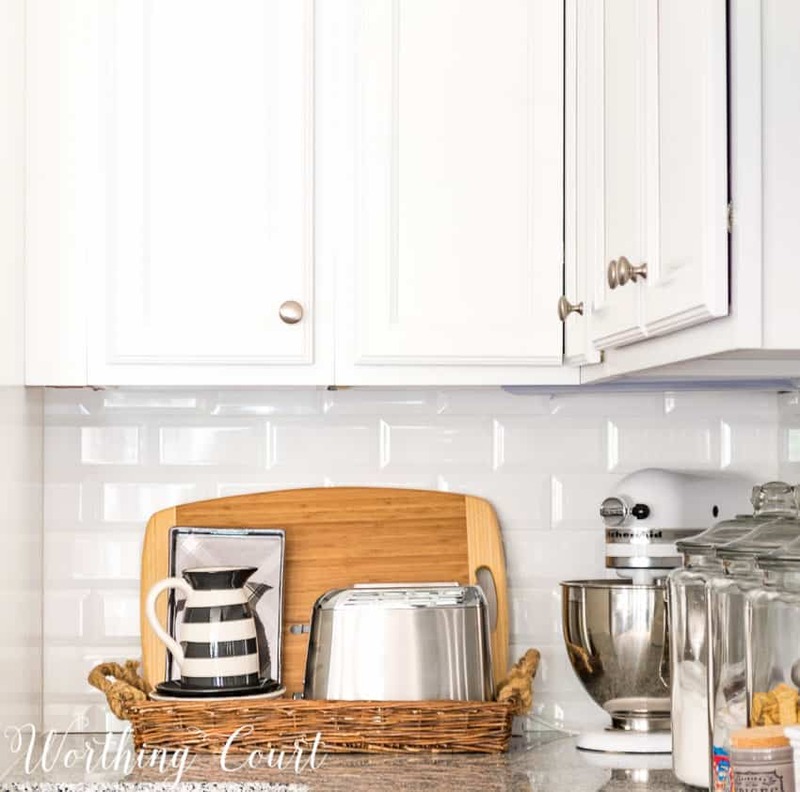 We have 37″ between the island and the counter on the oven side of the kitchen and 33″ between the island and the counter on the dishwasher side of the island. If you look at the photos, it appears that the island is located in exactly the center of the kitchen though. Our reasoning was that we wanted to be sure that if a hot oven door was opened while someone was sitting at the counter they wouldn’t be burned. Even though there are only 33″ on the dishwasher side, we can still open the dishwasher door all the way and can walk by it while it’s open, if we’re careful. I really helped us to determine our measurements by taping everything out on the floor with masking tape once all the old cabinets were gone. Good luck with your remodel! Thank you so much! We have 37″ on either side to work with so I believe an island is now a “go” in our renovation plans. Wow! The kitchen and floor turned out gorgeous! What a beautiful transformation! I especially like that you were able to find a home for the cabinets! I love the tiles you selected as well as the backsplash on the stove. I’m definitely keeping this for a future reference. When I get around to remodeling my kitchen, I’ll be using yours as an inspiration. Thanks for sharing this with us on #shinebloghop, Suzy! Great transformation. Gone are those countertops and a beautiful fresh, white kitchen in place for creating a delicious meal. Love the pops of bright green in your styling. I LOVE this & am thinking of copying it! 🙂 Beautiful & practical. You did an amazing job! I’ve remodeled my kitchen twice, and can still think of things I would do differently. This is gorgeous! We have a white kitchen that I’ve been wanting to change the floor and counters and we need to paint and do a backsplash. This is inspiring. what kind of counters did you end up with? I would love some like yours. Thanks for linking up with Pretty Pintastic and hope you join us for Small Victories Sunday Linkup too, which runs all week long across 12 blogs! Thank you so much, Tanya! For the counters, we wound up using granite from Lowes called White Pearl. I know that other places sell it, but it may be called a different name. What a beautiful kitchen and such a big project! Thanks so much for sharing at Throwback Thursday! Wow, what a beautiful kitchen! Great job! Thanks for sharing. I love your kitchen remodel! The crisp white is beautiful! 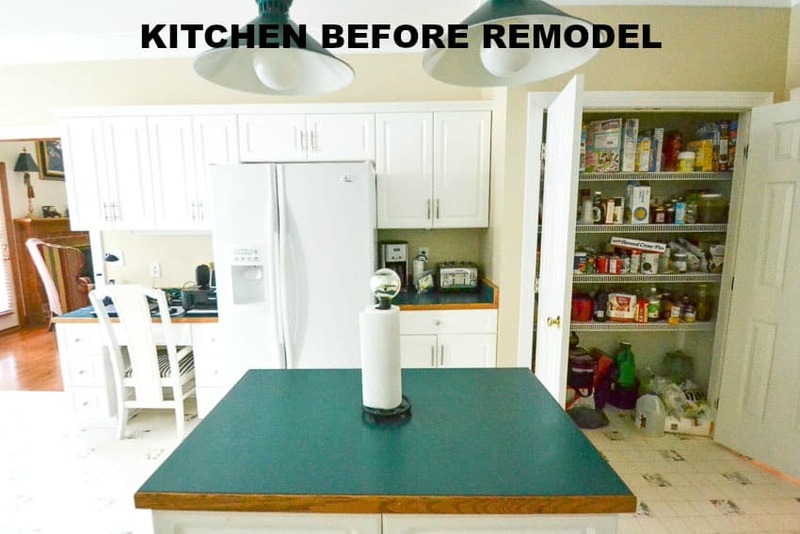 Thank you for sharing your kitchen remodel! We are building a house and this is just like what we want to incorporate into our kitchen. This kitchen is amazing! Trying to talk the hubs into a kitchen remodel, this is a perfect inspiration! Where did you get your runner rug in the kitchen? Is it a heavy weight so that it does not move around? Hi Chrystal. My rug came from Ballard Designs. Here’s a link to it: http://www.ballarddesigns.com/bermuda-indoor-2foutdoor-rug/rugs-drapery/rugs/indoor-outdoor/265547 . It is an indoor/outdoor rug and comes in multiple colors and sizes. I have the exact same rug, except in a different size and color, on my screen porch. Take a look under my House Tour tab if you’d like to see it on the porch. Anyway, the runner that is in the kitchen is not heavy and would need a non-slip pad under it to keep it from moving. Love the post, Suzy! Lots of inspiration. Thank you! Love everything about your kitchen. I, too, love black and white with pops of fresh green! Especially during the drab months of winter. I love your horizontal striped dish towels. Where could I find some for myself? I love the kitchen remodel! The Carrera marble mosaic backsplash is my favorite! I recently went to an estate sale where the small, gorgeous kitchen had an entire floor of the same marble! It was so gorgeous that I took a photo because I didn’t know what it was called and I wanted it for my own new kitchen when I won the lotto. Thanks! Love the lights over your breakfast bar!!! Where did you purchase them? Thank you, Melody! I purchased the lights at Home Depot a little over two years ago. I love your dining room and kitchen remodels. Great inspiration for my own kitchen and breakfast room remodels. Awesome kitchen remodeling. Loved your ideas. Thanks for sharing! What an amazing job, and it came out breathtakingly gorgeous! You did everything right, no shortcuts, and made good decisions. Wow!!!! I see you used beveled subway tile. I have been looking for 3 x 6 non-beveled off-white, but can’t seem to find them at stores like Home Depot or Lowes. They have white and cream, but not off-white. Does anyone have an idea where to find off-white, inexpensive 3 x 6 subway tile in NW Oregon? Thanks for any suggestions. Lovely kitchen. I noticed you put cup pulls on under your stove top, but not at your sink. What made you decide either way? We are remodeling our kitchen and that is a decision I need to make. There isn’t actually a drawer or a pullout for sponges at my sink, so there wasn’t any need for handles. I did think about putting handles there to give the impression of there being a drawer there, but decided against it because I knew that area would get rubbed against a ton and was concerned that the finish would rub off over time. Hope this helps and have fun with your remodel! Hello! Do you mind sharing your wall color? Hi Julie. It’s Sherwin Williams Accessible Beige. I love your style… I wish I wasn’t soooo afraid to give some of your ideas a try. I have looked high and low in your blog for where you purchased the pendant lighting over the island. I love them and want something similar. Thanks again for all the inspiration. Thank you for the information and encouragement. Love the paint color on the walls? What color is it? Hi Peggy. The walls are painted with Sherwin Williams Accessible Beige. What an amazing home! I love your “coffee caddy” among so many other things. Where did you get it if you remember? Suzy, yours is the first blog to show details of what you do and how to do it!!! Can’t thank you enough! We are planning to have our floors returned to the original hardwood in the kitchen and living room which is open together. They will have to feather it in. My question is… The floor guy said there should be a separation between the kitchen and living room. He says in case there was a problem in the kitchen it could be fixed easier. However, I like the look of a continuous flow. Hi Julie. I’m not an expert on flooring at all, but I’ll tell you what we did. When we added hardwoods to our kitchen (the kitchen floors were linoleum before), we had to feather the boards in at the opening to the family room, which already had hardwoods. Our kitchen also has an opening to the dining room, which already had hardwoods too, except the boards were running in a different direction that we wanted the boards in the kitchen to run. 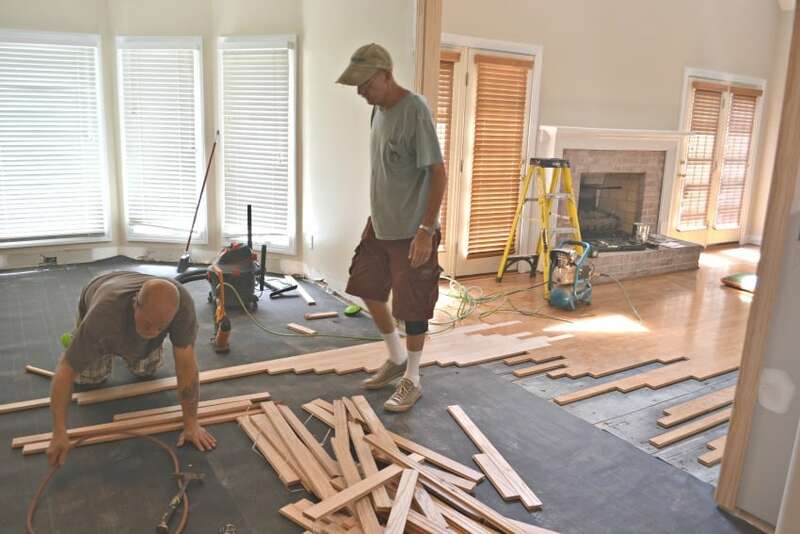 At the opening to the dining room, where the boards are running in a different direction, the installers were just very careful to do a good job of butting the ends of the new boards up against the existing floors. I don’t care for the look of separators, so we didn’t add any separation between the rooms at all. My reasoning was that in the unlikely event of a problem, we would replace the flooring in the areas needed. If you think about new houses that have an open concept floor plan and hardwoods in the kitchen, I’ve never seen them add any separators between the rooms – it’s just one continuous flow. Hope this helps! Hi there- I’m in the middle of planning our remodel and love the hood, although it is bigger than we need. 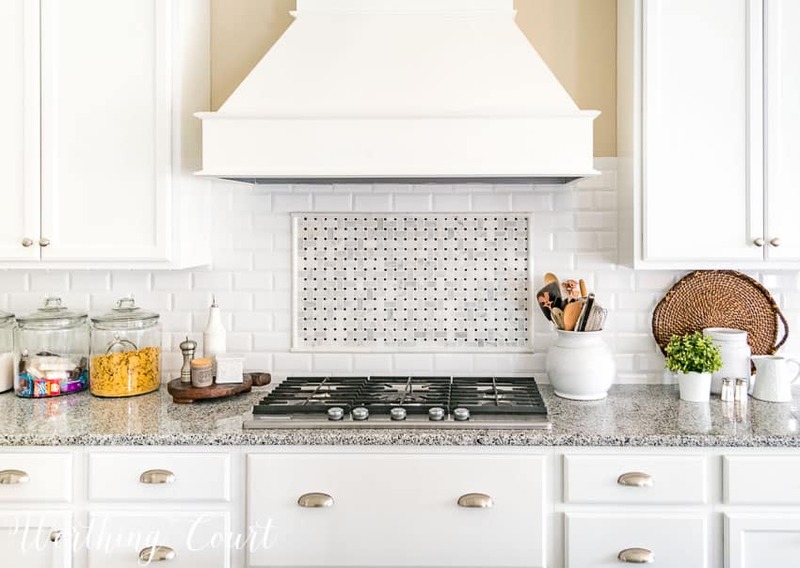 Where did you purchase the range hood– maybe I can find one similar but a smaller size! Hi Erin. Our cabinets and hood are the Diamond brand from Lowes. At the time that we remodeled our kitchen, I do recall that there were multiple sizes of the hood available. Hope your remodel goes well! I am really considering lighting over our breakfast counter…. Do you remember how far down you hung them? BTW, I love that you reply back.. So many other bloggers don’t…. 🙂 Happy Monday! I try to always reply, even though I’m slow sometimes! 😀 The bottom of the light fixtures is 35½” from the top of the counter. I thought that might be a better measurement since your ceilings may not be as tall as mine (9′) and the fixtures you use might be a different size. I think your kitchen turned out great. I especially love the lighting above your island. And I have always loved your breakfast area. Perfection! Love, your kitchen!!!! 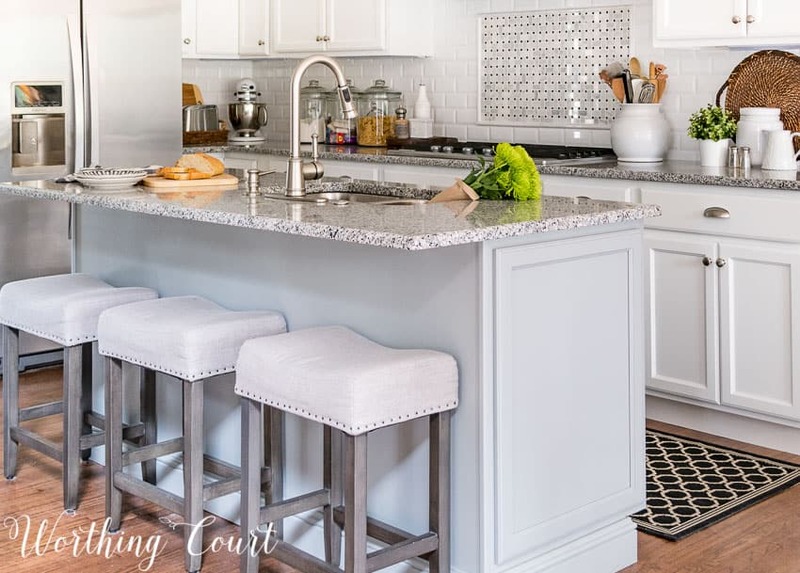 Can you please tell me where you got the bar stools from? And you have the grey color in the stools, I am ordering today?.